As a glamorous alternative to typical multi-stone bridal sets, many couples choose pave setting engagement rings, which are universally brilliant rings with unique designs. These rings are so popular because the glittering tiny diamonds create the breathtaking illusion of an unbroken diamond surface. A pave (pronounced pah-vay) setting is one where the ring's band is literally paved with diamonds. Small stones encrusted along the ring's surface give the appearance of a diamond rather than a metal band. Unlike channel or bezel settings, a pave setting uses only tiny beads or minute prongs to hold each stone, thus minimizing the appearance of the metal while maximizing the illusion of free-standing diamonds. Channel settings are set into the ring itself with a small rim of metal securing all the stones together in a line. Pave settings hold each stone individually with no rim of metal, therefore, allowing more light into each individual stone. Most pave settings are constructed from white gold or platinum in order to further minimize the metal appearance, although yellow gold can add a measure of traditional elegance. As an engagement ring, a pave setting incorporates a larger central stone above the encrusted diamonds, typically in a high Tiffany setting. Round and princess are the most frequent shapes for center stones because the remainder of the setting adds sufficient brilliance to the ring without the need of a fancier center stone. In some cases, the center stone may be a colored diamond or other gemstone that is heightened by its glittering surroundings. While most center stones are also set with prongs, bezel settings are also popular because they highlight the stone away from the setting. There are three basic designs for pave settings. The first is a simple, thin band with a single row of diamonds. The width of the band is matched to the width of the diamonds, making the entire band appear to be made from diamonds alone. A center stone is then mounted on the band. The second design is a three-dimensional, wider band. 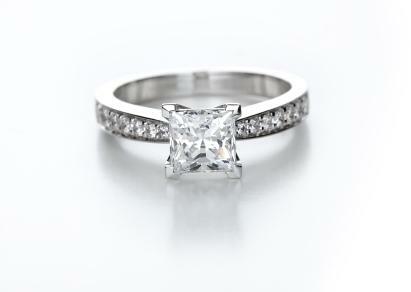 In addition to a single row of stones supporting a larger central diamond, other rows are set at an angle to the center row, creating a wider ring with a bow or curve adding additional texture. Without the center stone, this is a shimmering alternative for a men's engagement rings. 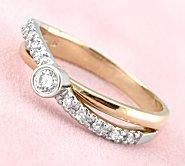 The third pave design is a simple band without a center stone. These rings have gained popularity as anniversary or eternity bands, but their glitter and glamor is perfect for elegant engagement rings as well. 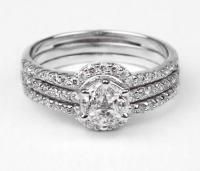 Whether or not a center stone is used, the band can be set in a curve or wave, creating an elegant and sophisticated ring. 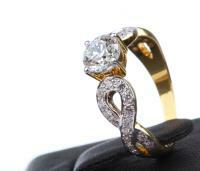 A "full pave" ring has the pave setting extending fully around the circumference of the ring. A "half pave" setting only covers the top portion of the ring. Some brides-to-be find half pave designs more comfortable to wear continuously. Type of metal used for the band and prongs. Whether the ring is customized or designer made. If there are any additional accents or embellishments such as filigree patterns beneath the center stone, engraving, etc. Initially, it may seem that using so many diamonds would be expensive, but smaller stones are often less expensive, and they do not need to be as high a quality as larger stones. Because of the recessed setting, flaws are not as visible, and using white gold or platinum to mount them helps improve their color. For couples with a very tight budget, there are several cheaper alternatives. Forgoing the center stone or choosing a colored gemstone instead of another diamond can help decrease the overall price. The pave stones could also be imitation diamonds or cubic zirconia rather than natural stones. The cost of a pave setting ring is calculated according to its total carat weight. The weight of all the stones together will likely be substantially greater than a simple solitaire engagement ring, although the type of stone and quality are both important pricing factors. The stones themselves are not the only price factor, however. Because the stones are more exposed, pave setting engagement rings require diligent care, not only for daily wear but also for cleaning and repairs. As with any diamond engagement ring, it is not recommended to wear the ring during heavy physical activity or while using harsh chemicals or cleaners. Pave settings naturally have more crevices and nooks than smooth settings and require more frequent cleanings. Soaking can help dissolve dirt and dust deep within the setting, but never use a harsh brush to scrub the ring; it could inadvertently scratch the metal or loosen the gems. Because many pave settings use indentations in the band rather than more secure prongs, it is natural for a stone to fall out occasionally. Regular inspections by a qualified jeweler help detect any loose stones or potential hazards, particularly after cleaning or repairs. If stones are lost, a pave setting is generally easy and relatively inexpensive to repair. 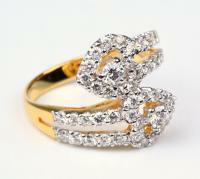 In fact, many reputable jewelers offer gem replacement policies on the small, inset stones. Pave rings should not be stacked on top of one another because the diamonds will rub more easily than with other, more protected settings. This can scratch the metal and damage the settings, increasing the risk of losing the stones. For the best protection, pave rings should be paired with plain wedding bands, not other pave settings that would cause more friction. The exception is if rings are purchased as an integrated set, in which case they are designed to be worn together without problems. It is important to note that because of the precision required to craft a pave setting ring, they are not easily resized. Partial pave settings can be resized more readily, but it is best to determine an accurate ring size before ordering a ring with a pave setting. Pave settings with their glittering surface of diamonds are an enchanting choice for couples. Although these rings require some specialized care and may be more expensive, they are yet another unique choice for couples who seek to symbolize their love with more than a single diamond.